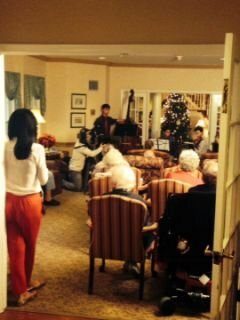 Sunrise of Fairfax, VA recently had the opportunity to experience the joy of a local classical music group, Grace Notes. Comprised of three talented James Madison High School students, the trio travels across Northern Virginia, “inspiring happiness in their audiences by bringing music to life.” Liam Murphy, Michael Giovanniello and Trentino Longhi have all been playing instruments since a young age and truly enjoy entertaining residents at senior living communities around the area. Songs vary from the classics to Civil War-inspired anthems and more eclectic sounds like Irish jigs. Other Sunrise communities lucky to have experienced Grace Notes include Sunrise of Hunter Mill, VA, Sunrise at Fair Oaks, VA, Sunrise at Reston Town Center, VA, Sunrise of Mclean, VA, and Sunrise of Arlington, VA. On Christmas, NBC 4 aired a clip of these talented young men when they played their most recent performance at Sunrise of Fairfax, VA. Some residents were interviewed, expressing how grateful they are for programs like this at their community because it is a “very stress-relieving, very- relaxing” program. One resident explained how she can see a difference in other residents’ faces as they listen to the tunes as it brightens their day. Sunrise Senior Living and Grace Notes’ missions align in that both strive to champion the quality of life for all seniors. Intergenerational programs like this one are a unique feature of Sunrise’s programming and activities which ensure that each resident enjoys taking part in activities that speak to their mind, body and spirit. Grace Notes puts on their performances free of charge, for members of their community who might have limited access to such live music. During the interview with NBC 4, one resident requested to “keep the music coming!” and that is exactly what Grace Notes intends to do in 2015.